Swet Studio is more than rowing, aerial yoga, meditation and fitness classes studio; it's a lifestyle. Swet Studio is a community-minded local studio for people who aspire to fulfill the full potential of both mind and body. Variety not only keeps things fresh and exciting, but allows the body to be worked out in different ways for FASTER, SAFER RESULTS. We are located at 480 Tremont Street, Boston, 02116. Learn all you need to know so you can safely teach classes that include zero-compression inversions, new movement sequences combined with different wraps, inversions & spotting. Looking for the most exciting team-building experience ever? Look no further! Great for bachelorette parties, corporate takeovers, influencer events, and birthday gatherings. Booking times are offered Monday-Sunday. No prior experience is needed. Don't worry! There's no commitment. Expires 30 days after sales date. NOT sharable. The best way to sample a little bit of everything, find your niche, and jumpstart your practise. Fitness, Aerial Yoga, Meditation and rowing, OH MY! Swet Studio makes sure that their fitness is scalable for everyone! So if you’re in the mood to try something new, you should definitely give Swet Studio a try! This South End fitness studio launched in 2015 with 1,500 square feet of exercise space and a creative lineup of fitness classes. "Boston’s most unique group fitness classes. 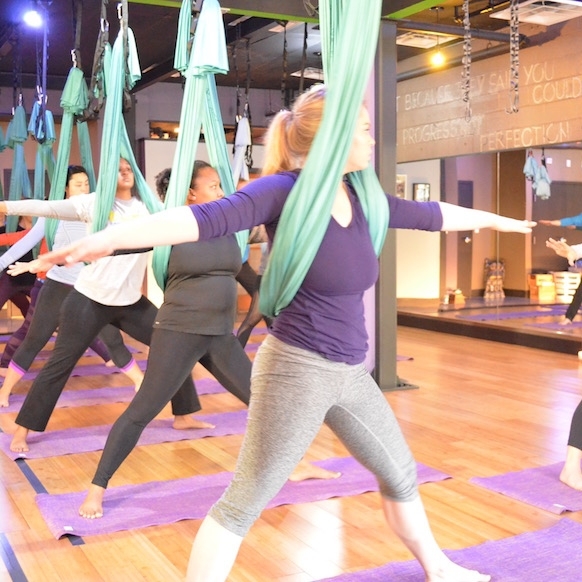 It’s also got welcoming, unpretentious vibes that make you feel right at home..."
Home | Schedule your private aerial yoga class.